PLEASE NOTE: This product is now obsolete. See 8103701 as a replacement. 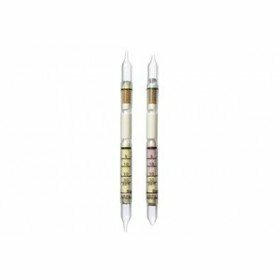 These Acrylonitrile Drager short-term detection tubes have a measurement range of 5 to 30 ppm and are also able to detect Dimethylaminoacetonitrile. Styrene up to 50 ppm does not influence the indication. Butadiene reacts with the oxidation layer; in the presence of butadiene, the acylonitrile indication will be too low (e.g. up to 50 % too low with 400 ppm butadiene).